The City of Hoover, Alabama, has made some big strides in switching to alternative fuels for its vehicles. It's using E85 fuel made from tree branches and manufacturing its own biodiesel made from used cooking oil. 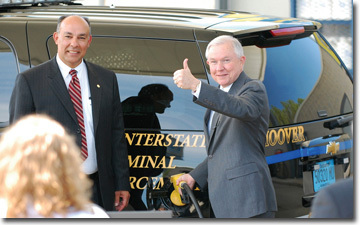 Alternative energy gets the thumbs up from U.S. Sen. Jeff Sessions (above, right) and Hoover Mayor Tony Petelos as Sen. Sessions pumps ethanol fuel into a Hoover police vehicle. The ethanol fuel is made from Hoover's own wood waste. Sometimes, getting involved with alternative energy is all about being a pioneer and making history. That was the case last April when the City of Hoover, Alabama, filled the gas tanks of its police cars with wood-based E85 fuel that contains ethanol produced from gasification of limbs and branches discarded by city residents. That was the first time this had ever occurred in the United States. Hoover has been burning E85 fuel derived from corn ethanol in its police cars for some time, which has attracted a lot of national attention, including a visit from President George W. Bush in 2006. The city was operating the largest fleet of police cars burning E85 at that time. Since then, the community has demonstrated that it is also possible to burn E85 fuel derived from wood waste generated in the community-waste that normally would have been sent to the landfill. Every week, the city picks up a lot of miscellaneous branches and limbs that previously went to the landfill. "We were paying landfill costs to dispose of the wood waste," says Hoover Mayor Tony Petelos. "But now, we can dispose of this waste product and make a viable fuel that we can burn in our police cars." in nearby Livingstone, Alabama. But it is also manufacturing its own biodiesel derived from used cooking oil collected from the city's 75,000 residents, which it burns in its heavy equipment and trucks. The city has purchased and operates two pieces of cooking oil-to-biodiesel conversion equipment as part of its Fleet Department. The City of Hoover's used cooking oil-to-biodiesel program began in 2007 and so far, some 30,000 gallons of biodiesel has been produced. The city runs 40 pieces of equipment on the cooking oil-based biodiesel and 191 cars on E85, representing 88 percent of the city's entire rolling fleet. 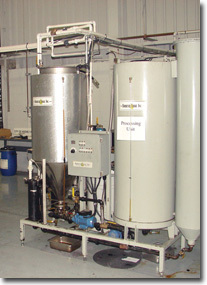 The cooking oil-to-biodiesel equipment was purchased from a company called Biodiesel Logic Inc., located in Athens, Alabama. The company was co-founded five years ago by Jeff Breeden and John West, with the first couple of years spent in research and development. West is the designer of the units. Today, the company manufactures biodiesel manufacturing units capable of producing anywhere from 55 gallons to 2000 gallons over a six hour period, using any type of raw material that is capable of delivering a raw oil product that can be converted to biodiesel. This can include cooking oil, animal fats, vegetable oils, canola seed, sunflower seed, and even certain types of nuts. 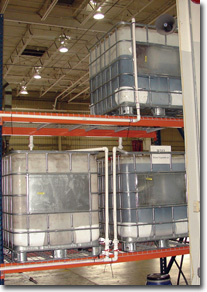 Biodiesel Logic has sold units throughout the United States and Canada. The company even has one of its systems operating in Africa where laborers gather wild nuts, crush them, and convert the nut oil into biodiesel. The City of Hoover runs 191 cars on E85 and another 40 pieces of equipment on cooking oil-based biodiesel, representing 88 percent of the city's entire rolling fleet. The E85 is being burned in General Motors Flex-Fuel Chevrolet Tahoe vehicles. E85 is a mixture of 85 percent ethanol and 15 percent gasoline. "Our city council thought I was crazy at the beginning," says Petelos. "I had a lot of naysayers and continue to have a lot of naysayers. But everything that we have done over the last five years has made economic and environmental sense." He adds that Hoover has had no performance issues related to operating its vehicles on E85, whether the ethanol in the fuel is derived from corn or wood waste. In fact, because E85 is a cleaner burning fuel, they have saved money on maintenance costs as the vehicles can operate longer between oil changes. So far, the city's vehicles have driven more than 10 million miles on corn-based E85 alone. Fahrenheit, because they've noticed that the biodiesel tends to gel up when it gets extremely cold. In terms of cost, E85 is bought and sold as a commodity. The rule of thumb that Hoover uses is to buy E85 at 30 cents a gallon cheaper than gasoline. That's because vehicles running on E85 burn more fuel than regular gasoline, according to Petelos. By paying 30 cents a gallon less, the cost balances out with the additional consumption. According to Biodiesel Logic's Jeff Breeden, Hoover is manufacturing the biodiesel for about 91 cents per gallon, when all savings in equipment, operating, and maintenance costs are factored in. The partnership with Gulf Coast Energy Inc. to purchase wood-based E85 is in its early stages with the city having only purchased about 1000 gallons of fuel. However, both the company's owners and city officials have high hopes for the business venture. What they've proven so far is that burning wood-based E85 in commercial vehicles is viable. "One of the challenges was getting a letter from General Motors stating that burning the wood-based E85 would not void any warranties and that the fuel was ASTM certified," says Petelos. Hoover actually sought out a partnership with Gulf Coast Energy, wanting to be the company's supplier of wood waste during its process of proving its gasification technology. The Gulf Coast Energy gasification process can produce about 215 gallons of ethanol per dry ton of wood waste. Petelos believes the city produces enough wood waste to produce between 350,000 to 400,000 gallons of ethanol per year. What's been required of the community? They just pick up the wood waste, grind it into smaller pieces, and deliver it to the pilot plant. The wood waste to ethanol gasification process being refined by Gulf Coast Energy was developed by a scientist in the state of Mississippi and is a different process for manufacturing ethanol than the typical fermentation process used to convert corn to ethanol. It has been described as a closed loop system that does not emit carbon dioxide. What's exciting for Hoover is the technology's potential. "There are nine different types of fuel that they can make," says Petelos. "And the process that they use is a chemical process, so there is no water involved in it. It's a pretty clean process." Although Gulf Coast Energy has announced plans to build three full-scale commercial plants, one in the vicinity of Hoover, the recent economic downturn has temporarily sidetracked that plan as the company undergoes a restructuring. Mayor Petelos is realistic about the current economic situation and understands that the purpose of the existing pilot plant is to try different formulas and conduct tests as a proving ground for the technology. The City of Hoover manufactures its own biodiesel (derived from used cooking oil collected from the city's residents), which it burns in its heavy equipment and trucks. The city has purchased and operates cooking oil-to-biodiesel conversion equipment (right) as part of its Fleet Department. The city is pleased just to be part of the cutting edge in the development of alternative fuels that will allow the United States to be less dependent on foreign oil. One positive element to using wood waste instead of corn to produce E85 is that it is a non-food raw material. The city's used cooking oil-to-biodiesel program is a bit further ahead in its development. It began in 2007, and so far the city has produced 30,000 gallons of biodiesel. Hoover has set up used cooking oil collection sites at municipal buildings and the fire station. Residents can either drop off the used cooking oil in the original container or pick up a container supplied at the depot. "The first 10 days after Thanksgiving, we collected 1000 gallons of oil," says Petelos. "That's from people frying turkeys." He adds that the conversion process to biodiesel is not complicated. Biodiesel Logic's Jeff Breeden says its systems are designed with simplicity and ease of operation in mind. "The mechanics do it," says Breeden, referring to how the manufacturing process works at the Hoover Fleet Department. "It's so labor friendly that it doesn't take an extra person in a shop to run this program. It doesn't take a rocket scientist or chemist to do it. An average laborer can do it." He describes the process as safe, and that it leaves no environmental footprint, with the only byproduct being glycerin. A car wash company picks the glycerin up from the City of Hoover and makes soap from it. A major advantage to the city with this collection and conversion project-in addition to reducing its dependence on commercial diesel fuel-is that the cooking oil is not being dumped down the drain, which causes havoc with its sewer lines and sewage treatment plants. Both Mayor Petelos and Breeden say that's where Hoover earns most of its savings with its biodiesel production program, because cleaning clogged sewer lines and equipment due to cooking oil accumulation is expensive. The project has been so successful that the Environmental Protection Agency (EPA) has conducted an investigation and has included it as a model program for other cities. So far, over 100 other cities have toured the Hoover operation for biodiesel production, and 10 have duplicated their system. Breeden says use of the equipment by Hoover has opened up the municipal market for Biodiesel Logic's technology.